This sister ship of the Linssen 45.0 AC motoryacht has an extremely spacious saloon, which together with the open saloon doors and the open cockpit creates a huge living space. 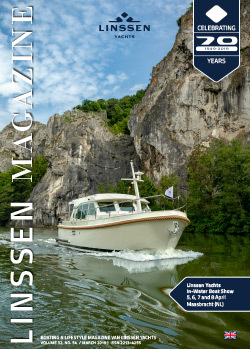 The new Linssen Grand Sturdy 45.0 Sedan is the ultimate voyage boat. Even though we say it ourselves, enjoying the space on board is a massive experience. We are summarising the most striking characteristics and details here. However, if you have the opportunity, step on board our new Grand Sturdy 45.0 Sedan. Then you will really learn to appreciate it. The hull shape and construction of the Grand Sturdy 500 AC Variotop® are the basis for the new Grand Sturdy 45.0 below the water line. This patented new hull shape, the Softchine Prestressed Hull (SPH®), ensures that when sailing, you will experience less resistance, less noise and use less fuel. In other words, the Grand Sturdy 45.0 has unprecedented levels of stability, low noise and easy handling. It has two powerful Volvo Penta diesel engines as a standard feature for stable propulsion. The Grand Sturdy 45.0 Sedan is the only Sedan motoryacht from Linssen with this unique sliding door on the port side. From the helmsman’s position, you can easily get to the cleat to tie up quickly in a lock or marina, so that you can then position the boat at your leisure. The Grand Sturdy 45.0 Sedan has a spacious, comfortable and luxurious saloon with a great deal of living space for you and your travelling companions. The large windows in the saloon ensure pleasant contact with the exterior and let in lots of natural light. The starboard side houses a spacious galley with a comfortable folding table and two cocktail chairs. A pleasant place to have breakfast together. If there are more of you, there is a spacious u-shaped dinette on the port side. The large electric e-Variodeck ensures an optimal interior climate under all conditions. Open the sliding roof slightly for a cooling breeze through the saloon, or open it completely to enjoy the sun. The spacious forward cabin is your domain. It has a large and comfortable double bed and enough surrounding space to move, cupboards and storage areas for clothes and other possessions. With a separate toilet on the starboard side and a shower on the port side, you have all the privacy you could wish for. There is a guest cabin amidships with two single beds. Guests can use their own toilet/shower in the passage on the starboard side. The forward compartment also provides access to the large multifunctional ‘cellar’ storage space. The cooling drawer for wine or champagne and the integrated bar cupboard drawer are well thought-out and functional. The integrated cockpit bench in the spacious open cockpit is an enjoyable place to sit. The standard extended saloon roof offers you protection against less favourable weather or shelter from the blazing sun. The central stern door provides access to the swimming platform by means of the Linssen Centre Line Traffic. The saloon roof is provided with integrated drainage. There are also two solar panels concealed in the saloon deck for extra power supply.